United Way’s partnership with the National Football League is the longest running collaboration in history between a major sports league and a nonprofit. Established in 1973, the NFL and United Way launched the largest public-service advertising campaign in the nation’s history to increase public awareness of social service issues facing the country. 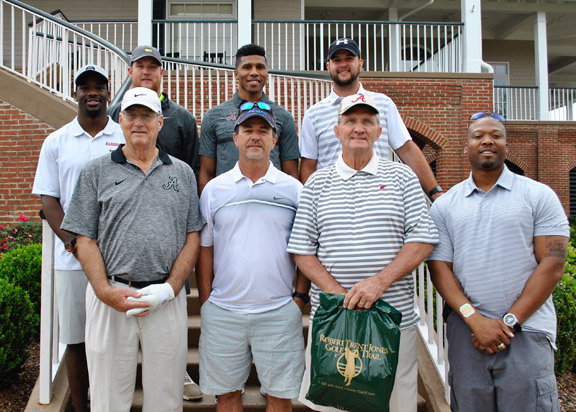 Celebrating the rich legacy of sport and athleticism within the state of Alabama, UWSWA builds on this partnership by inviting active and retired professional athletes from across all fields of play to take part in an annual golf tournament and LIVE UNITED. By participating, you are helping us advocate for health, education, financial stability, and life’s basic essentials for every person in every community we serve. Thank you for joining us as we provide tremendous opportunities and create lasting improvements in Southwest Alabama. We invite you to join us as a sponsor for this event by choosing from one of our Tournament Sponsorship levels (ranging from $150-$2,250) and/or supporting us through donations of various auction items. As a sponsor, your business will be promoted to a broad range of locally-engaged and civic-minded individuals and professionals. This is a great opportunity for your company to receive exposure to potential clients, help support a worthy cause, and have a fun day on the links! Please contact Dee Dee McCarron to reserve your spot today or for more information. Call (251) 433-3624 or email ddmccarron@uwswa.org.